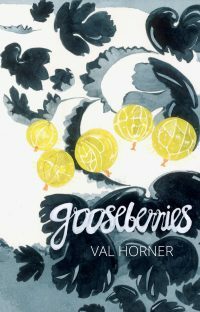 The poems of Val Horner, exquisitely illustrated by her daughter Tina, in turn illustrate why Val is such a popular poet. Val Horner is a poet who, though initially quiet and unassuming, always seizes our attention and commands our rapt respect. On the one hand, these poems are gentle musings, yet on the other she touches an eternal truth to which we all need to pay attention. She puts ideas into simple words – that is, gives form to – fleeting perceptions of what it feels like to be alive and alone in an utterly mysterious universe. Gooseberries is long overdue and has been exquisitely illustrated by Val’s daughter, Tina. These illustrations are extensions of the poems and are an integral part of them.